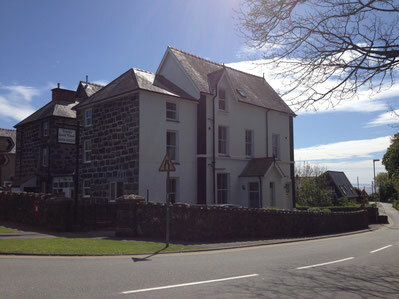 Tirionfa is a 3 storey semi-detached property sitting back from the road. The driveway is on a small slope and has no steps. The entrance to Tirionfa is via a porch with 3 steps, 20cm each in height, leading up to the main front door, through which is the front hall. This has access on the left into the guest lounge, further down the hall on the right is the breakfast room and ahead a flight of stairs to the first floor, 16 stairs in total. The first floor has guest bedrooms 1 to 4 all accessed via a level corridor, a separate fire exit stairway, 16 steps down to an external door with 4 external slate steps and a further flight of stairs to the second floor, 16 stairs in total. Guest room 1 has a short corridor then 3 steps down, with handrail, to access the bedroom, bathroom and toilet. Guest room 2 has external access to a secure roof top terrace. The second floor has access via a level corridor to guest room 5 and room 6. Guest room 5 has a short corridor with door to the single bedroom, then 4 steps down, with handrail, to access the double bedroom and bathroom. The entrance porch and corridors are all well lit. In case of hearing the fire alarm the fire assembly point is the grass area to the front of the building where High Street meets Lon Fel.